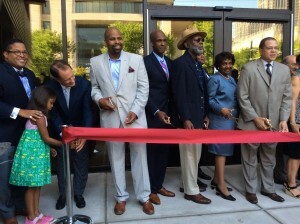 Last week Sovereign Construction and Development had the honor and privilege of participating in the grand reopening celebration for the Auburn Avenue Research Library on African American Culture and History. The grand reopening took place on Thursday, August 4, 2016 and was attended by a number of community, religious, and civic leaders including Fulton County Board of Commissioners Chairman John H. Eaves, Commissioner Joan P. Garner, District 4, and Atlanta City Councilman Kwanza Hall. The newly renovated and expanded 56,000 square foot Auburn Avenue Research Library is part of the Phase One Library Capital Improvement Building Plan. The phase one portion of the building plan included the construction of 8 new libraries, the expansion of two libraries, and the renovation of 7 libraries. J.W. Robinson & Associates, Inc. and the Freelon Group provided design and engineering services for the library. Cooper & Company General Contractors and Sovereign Construction and Development provided construction management services. The joint venture team of Heery International and H.J. Russell & Company provided program management. In addition to culture and history, sustainability was also a major focus for the design and construction team. The Auburn Avenue Research Library expects to achieve LEED Silver certification, which will allow for more efficient maintenance and operations activities that will have less of an impact on the environment.